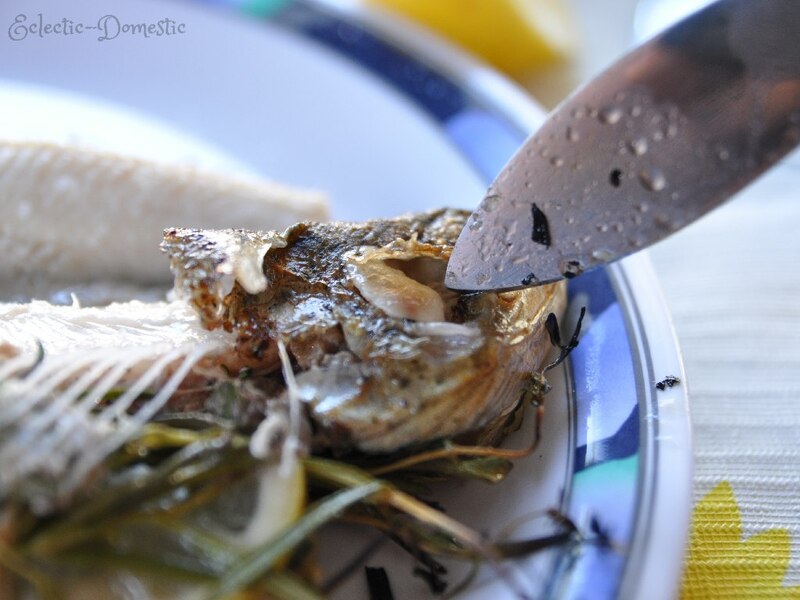 As is the case with meat or poultry, cooking fish whole and on the bone adds flavor. Here’s how to fillet it easily once it is cooked. This is by no means the only method, but it’s a method that works reliably for me. All you need is a fork and a knife. I recommend using a fish knife if you have one, but that is not altogether necessary. 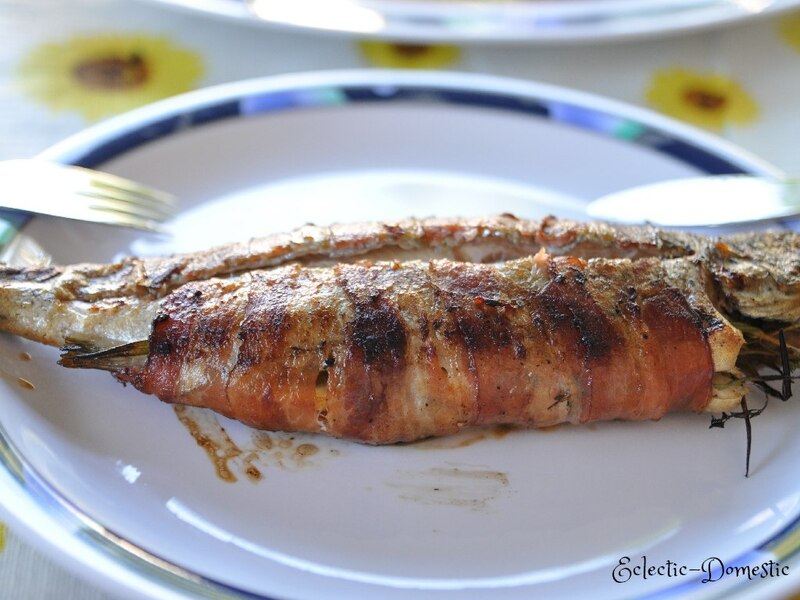 By the way, these pictures are from my recipe for bacon-wrapped stuffed grilled trout. 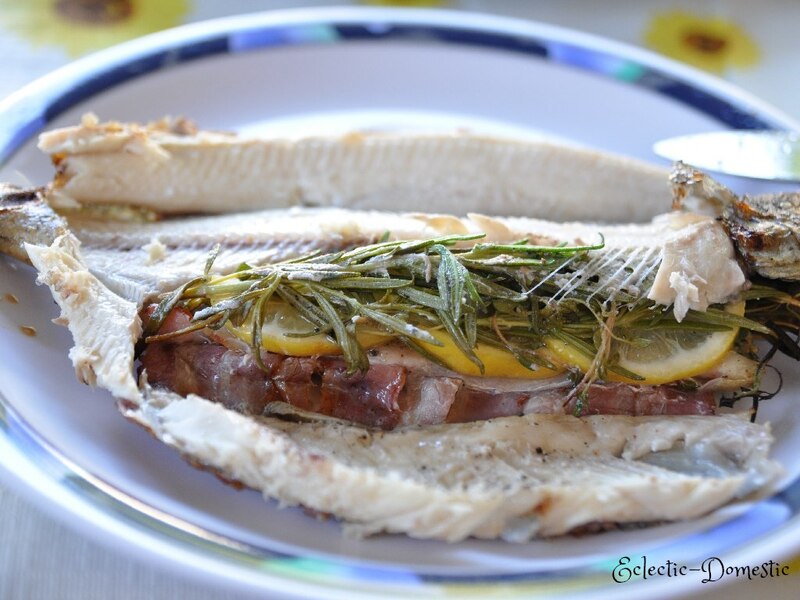 In that recipe, the bacon keeps the fish nicely together and protects the skin on the grill, while lending additional flavor to the fish. However, I use this method with all whole fish. 1. With the fish on its side, make a cut along the middle (along its side). Use a light touch. You will feel when you reach the ribcage because you will encounter some resistance. 2. Slide the knife upwards and downwards from your cut along the ribs (in the same direction the bones are running) to separate the two large fillets from the bones. 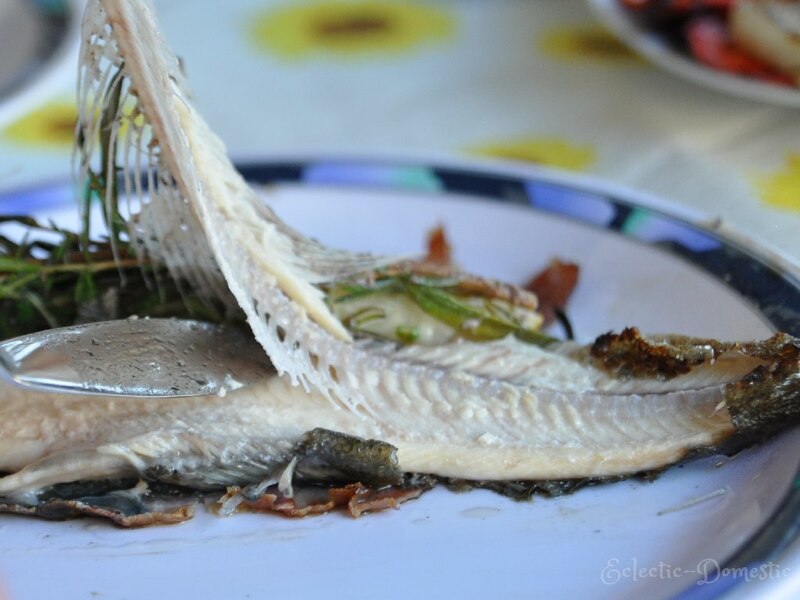 In this picture, the way the fish is lying, that means toward the top and bottom of the photo. I pressed a bit hard here and some of the bones (center of photo) came along with the fillet, exposing the herbs. In the best case, this won’t happen to you. However, if it does, simply slide your knife along the fillet to find and remove the bones. 3. Cut off the head. In the cheek (esp. of the trout) there is a small scallop-shaped piece of meat that is considered a delicacy. You can “fish” this out with your knife. Repeat on the other side. 4. From the head end, lift the bones (spine and both sides of the ribcage) with your fork while running the knife underneath to make sure no small bones have remained. Eat the remaining fillet. That’s all there is to it. Bon appetit. Now you’re making me hungry! Looks delicious.